What a pleasure it was to be invited by the Magna Band to host a workshop for their 2015 Summer Music Week. The band is a community organisation open to players aged 8 years and up: “…Getting music into the community and the community into music…” is their slogan and they certainly seem to be busy in this, enjoying a full schedule of events throughout the year. I was particularly interested to hear that the band will engage in cross-genre endeavours, as well as taking on more progressive/modern compositions, including recent projects with an Indian classical music group, and also in developing a performance of the American minimalist composer Terry Riley’s ‘In C’, where players are encouraged to improvise around a loose score. It was with this exciting angle to the band’s repertoire in mind, that I decided to try and aid in developing the notion of improvisation amongst these brave young musicians. When I arrived, the band was already struck up and getting to grips with a brace of challenging compositions: Mussorgsky’s Night on Bald Mountain and Saint Saens’ Danse Macabre. What a start! Preceded by conductor Julie Maxwell’s pep-talk about engaging the notated marks of expression, how better to fire the imagination and creative juices than getting stuck into music depicting Death personified and a sabbath of witches and sorcerers (I should perhaps mention at this point the theme of this year’s Magna Band Summer Music Week was Magic!). 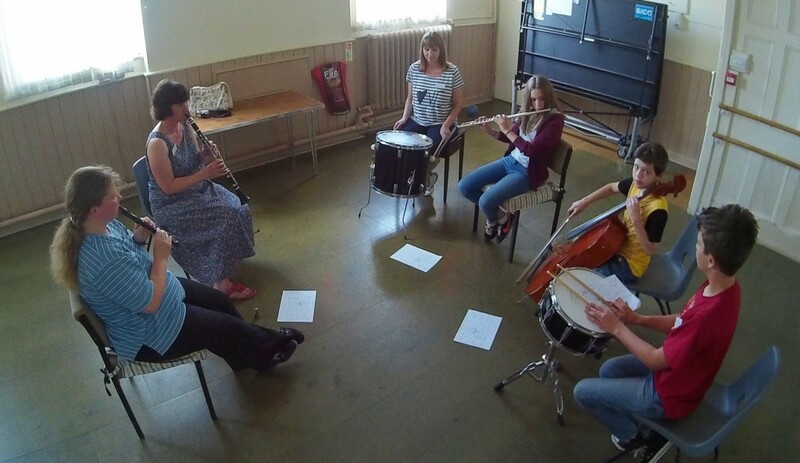 Now, improvisation can quickly become a massive subject – certainly within music – but I wanted to focus on specific areas which might encourage the players to think differently about composition and interpretation, with a deliberate move away from strictly notation-led structures. 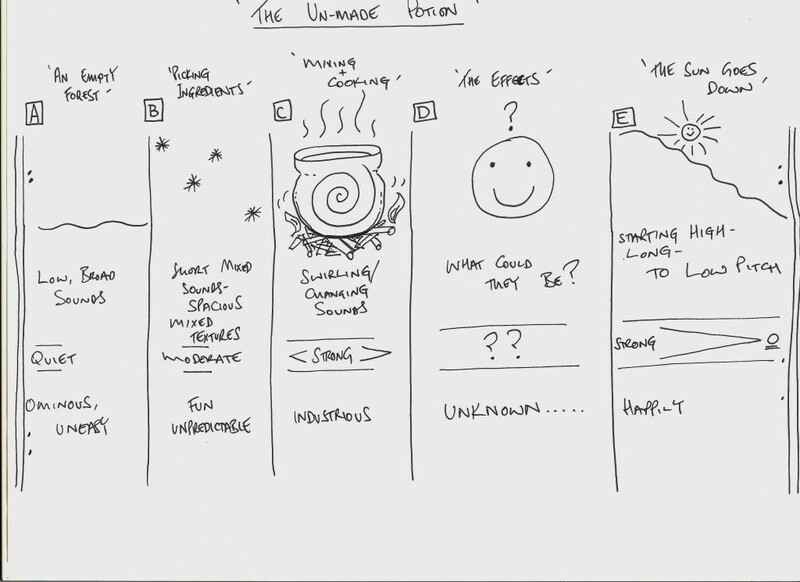 I prepared a basic visual score to work from: ‘The Unmade Potion’ (see what we did there?! Magic? Improvisation?….). The score’s content was designed to be accessible to all skill levels and ages: we can interpret simply only the visual elements and/or augment these with the section indicators written above each: [A] depicting ‘An Empty Forest’; [B] ‘Picking Ingredients’; [C] ‘Mixing + Cooking’; [D] ‘The Effects’ …of the potion (this is left open to wider, individual interpretations); [E] ‘The Sun Goes Down’, which can be used to bring the composition neatly round to a repeat back from [A]. Below each visual is a more direct aid to getting started with that section: some instrumentalists are happy to ‘play a picture’, but others prefer a more formal nudge towards what is being asked of them. I also added (informal) dynamic indicators and marks of expression for added guidance, if needed. The Magna Band was massed at a strength of 30, so we split this into 5 ensembles and made full use of the extra rooms within Wigston’s United Reformed Church, which plays host to the group’s weekly rehearsals. I suggested that groups start with a look at each section in turn and get comfortable with that sound world and vibe before moving to the next and so, off they diligently went! Magna Music Band players get to grips with improvisation during their workshop with Lee Allatson of Dye House Drum Works, Leicester. Moving between rooms whilst the ensembles rehearsed, it quickly became apparent that the concept was a popular one: the core principle of using your imagination led to pretty much immediate bursts of playing from all of the aptly named rooms (Dragon’s Den, Unicorn Cloud Forest, Gryphon Lands, etc…). Interestingly, but perhaps not surprisingly, the younger ones finding the initial challenge more accessible than some of the more seasoned musicians attending. 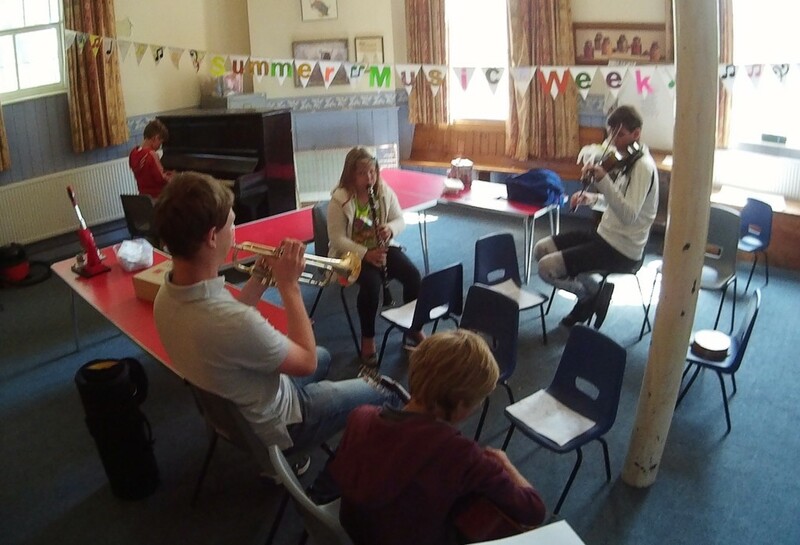 Magna Music Band Improvisation workshop: ensemble practice at Summer Music Week, 2015. I would offer suggestions by way of discussion only, most often cupping hands behind my ears to get players to listen, leading them to an immediately bettered balance between instruments. An interesting and unpredicted twist presented itself, when groups started composing within each section of the chart – completely circumnavigating the concept of improvisation! Quite natural, I suppose, but we used this as a vehicle to then open out and be conscious of playing differently each time, around the composed elements which the ensemble had added. 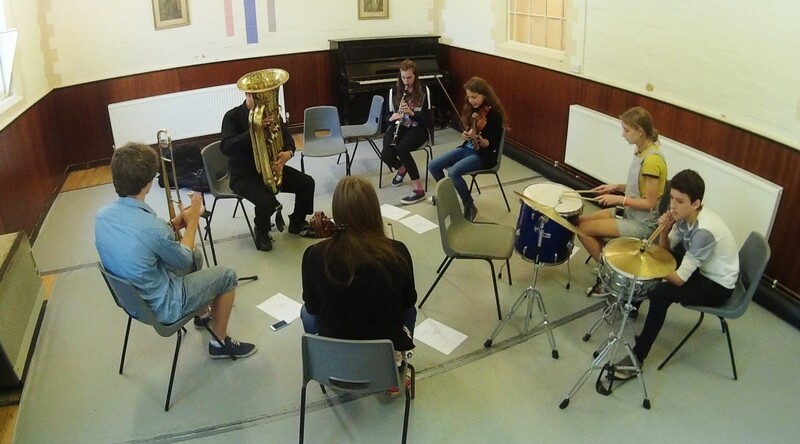 Magna Music Band 2015: Ensemble practice, developing improvisation. 2015 Magna Music Band Summer Music Week: Improvisation Performances. Dye House Drum Works offers a range of Masterclasses and Workshops covering a wide variety of topics: Musicianship, improvisation, solo/ensemble, practice and learning skills relevant to all instrumentalists, as well as specialist presentations on all aspects of drum set playing.